Erica has been a frequent visitor and you may remember her posts: 6 Early Signs Of Dementia In Elderly Women, Lewy body dementia – Symptoms and Diagnosis, or Mom with dementia – What to gift them on Mother’s Day? Living a life with memory disorder diseases like dementia and Alzheimer’s can be difficult to cope with. Alarmingly, there are many people in the world who at some point in time, but usually in the later stages of their lives, develop this disease. Currently, more than 5 million Americans are living with some kind of memory disorder and 1 in 3 senior patients die with Alzheimer’s or another type of dementia. Dementia is a serious disorder that strikes older adults more commonly, and if timely treatment is ignored or the disease does not get diagnosed in its early stages, it can reduce a person’s ability to practice life’s daily routine. Diseases related to memory loss slowly and gradually affect a person’s ability to recognize important life events, loved ones, and familiar sights and sounds. Patients also have challenges associating objects with meaning. While no permanent cure has yet been discovered for memory loss and other related symptoms, there are certain medicines that help control early symptoms, and therefore are able to delay the effects of dementia. More recently, a breakthrough research concluded that yoga and meditation may also be helpful in preventing and improving the quality of life for both patients and their caregivers. This one British study suggests that yoga and meditation may help patients caregivers socialize more and feel better in general. Another study in which yoga and meditation were included as part of a complex 36-point therapeutic program suggests that memory loss may even be reversed with regular practice. Here are some ways by which yoga and meditation help improve your memory and health. Regular yoga practice and meditation can prove to be beneficial in preventing cognitive decline and memory loss. In the 7 Amazing Brain Benefits of Meditation, the writer highlights that the patients with least symptoms of memory disorder, who practiced mindful meditation showed satisfactory results than those who didn’t. The researchers also compared meditators with non-meditators and found greater neural connectivity in their ’default mode network’ – an area of the brain which is involved in activities like daydreaming and thinking about the past and the future. Through various studies, researchers have found that yoga and meditation help patients feel less isolated and lonely. These are the two feelings which can lead to an increased risk of developing memory-related diseases. Regular practice of yoga and meditation also reduce stress hormones which are known to increase the risk of developing dementia. It also helps patients feel calmer and protect the brain by increasing protective tissues. Bhastrika Pranayama is a famous breathing exercise that helps in increasing immune power. This technique improves blood circulation and concentration, and relaxes the mind and body. It is also helpful in relieving stress, hypertension, and depression. Yoga is also highly recommended for caregivers who spend a lot of time taking care of patients with dementia. Continuously dealing with mood swings, lack of understanding and a number of other challenges can risk depleting caregivers. It holds even more, truth if the caregiver is a loved one. This is one reason why yoga is almost necessary for caregivers so they can care better. Results will show with only a few minutes of yoga and meditation every day. People with dementia or other memory disorders normally experience emotional distress, mental turmoil and are in a perpetual state of confusion. Stress, anxiety and mood swings can have a negative impact on their overall health. Regular yoga and meditation are known to lower stress levels, control depression, fatigue and improve overall well-being. Various studies have also hinted that yoga may improve anyone’s mood if practiced on a regular basis. Patients with memory loss or dementia have too many things going on in their minds. They cannot recognize anything that was once familiar, and at the final stages of the disease, most patients become silent. If caregivers help patients practice a few minutes of yoga and meditation every day, there will be a visible difference in the way patients deal with their disease. Whether they are feeling glum or dejected, or feeling at ease and hopeful can have a huge difference on the prognosis. It has been observed that yoga and meditation are just as effective as brain games and crosswords for memory improvement. Incorporating yoga practice in your daily routine has many positive effects on the mind, body, and soul. If you or any of your loved ones are trying to improve their memory or offset the risk of developing memory loss or dementia, a regular practice of yoga and meditation could be a simple, safe and least expensive solution to improving your brain fitness. An even better way may be to take a yoga retreat with a loved one to fully immerse yourself in the benefits of yoga and meditation. My father, who had Lewy body, practiced meditation for a few years prior to his death. He took it up as a way to deal with his stress and depression. After reading this, I do wish I’d talked with him more about whether he felt it helped. I know there are so many unanswered questions after someone passes on. I agree that any period of calm and introspection can be helpful not only to Alzheimer’s patients, but to us all. It seems logical that as someone’s mental capacities diminish, engaging in yoga and meditation can help. But at the same time, the challenge must be so great – to be able to focus and relax. Very eye-opening. I have recently started yoga myself and I love it and meditating. Hoping to attend a meditation class tomorrow with Maureen. I’ll go by myself for a short while if I have to and bring back good news! That’s a great idea Paul! Funny…my mom doesn’t believe in yoga or meditation, but it’s one of my favorite activities. I can totally see it being an important of keeping your mind active. I think it must be something with the older generation. Unless it’s prescribed by a Dr. they don’t seem to see much benefit from it. Me too! and in that order! 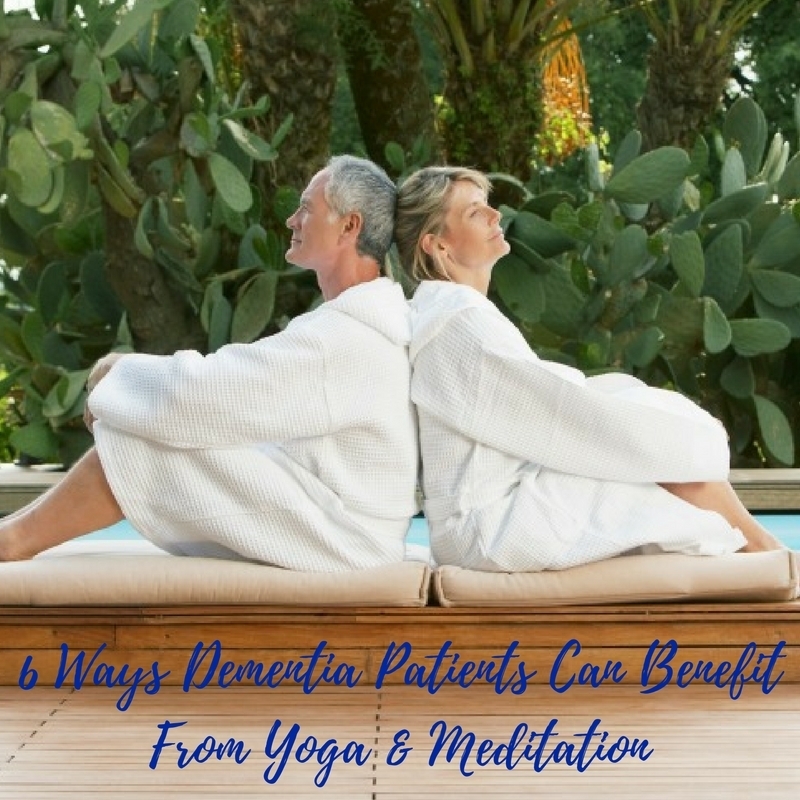 I didn’t realize yoga and meditation had so much benefits for those with dementia. This is very helpful, thank you for sharing! I didn’t know that. Yoga is so magical. even dementia can be prevented. Great post, my friend was suffering from dementia , and he started doing the yoga, and the things that he achieved by doing yoga is just unexplainable. Not only he get better from dementia but also his varicose vein problems are getting way.